First prepare all the vegetables: Thinly slice bell peppers, carrots, avocado and cabbage. 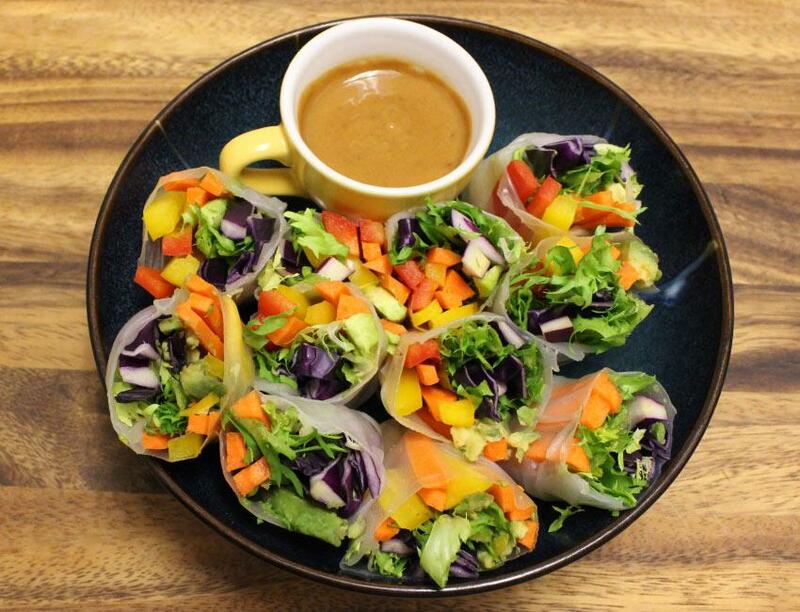 Set the vegetables aside with the frisee lettuce and began preparing dipping sauce. For the sauce: Whisk together peanut butter, rice vinegar, water, soy sauce, honey and red pepper flakes in small bowl and set aside. For Spring Rolls: First fill a shallow dish with warm water. Next submerge one of the spring roll wrappers in the water until softened but still slightly stiff (15-25 seconds). Then lay the wrapper down and place a few pieces of each vegetable in the lower middle of the wrapper. Next fold the sides of the wrapper over the filling and starting from the bottom begin rolling it up. Repeat for the remaining rolls. Serve with the dipping sauce and enjoy!